A new camera angle makes drifting easier in Forza Motorsport 7, too. 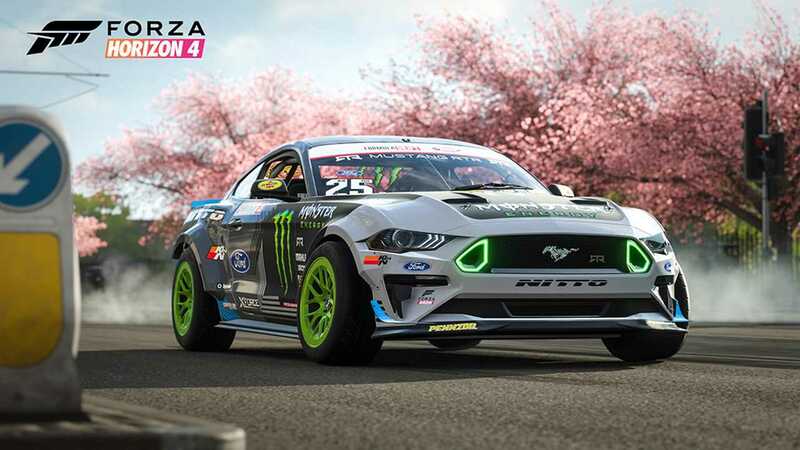 The monthly updates for Forza Horizon 4 and Forza Motorsport 7 are here, and both of them add a trio of drift-ready Ford Mustangs to their respective games. The new vehicles let players pretend to be Formula Drift drivers Chelsea DeNofa and Vaughn Gittin Jr. as they slide around a fake English countryside or tracks around the world. The #25 2018 Ford Mustang RTR with Monster Energy sponsorship is Vaughn Gitten Jr's current weapon of choice in the Formula Drift series. It packs a naturally aspirated Roush-Yates-built V8 that redlines at a heady 9,000 rpm. It should be plenty of fun to slide. Alternatively, there's Chelsea Denofa's #88 2018 Ford Mustang RTR with BC Racing sponsorship. It has BC Racing coilovers, a custom independent rear suspension setup, and a four-speed dog box transmission. Finally, there's the road-legal 2018 Ford Mustang RTR Spec 5. It wears a widebody kit that allows for wider wheels underneath the car. The powertrain remains stock, including a 460-horsepower (343-kilowatt) 5.0-liter V8 and 10-speed automatic gearbox. Despite going on sale in October 2017, Turn 10 Studios continues to improve Forza Motorsport 7. The March update has a new Drift Cockpit Camera that should fit well with the month's additional cars. It puts the view inside the cabin but pans the camera depending on the level of steering lock. Players can increase or decrease the sensitivity depending on their preference. Folks who play Forza Motorsport 7 with a wheel should download the March update immediately because it has some major improvements for the peripheral. Players can now tune the settings, including force feedback, on a per vehicle bases. In addition, the force feedback damper and load sensitivity are now changeable. For monitoring things, there's a new wheel telemetry panel in the options that for monitoring the force feedback torque, damper, and spring to the wheel, which should help better visualize what the new tweaks actually do.